Solar street lights are powered by solar panels mounted at the top of the pole. They convert sunlight into electricity. The power is then used to charge the units battery throughout the day. Night mode is automatically detected and activated at dusk by the drop in solar charge voltage. The intelligent charge controller detects that the charge cycle is complete and illuminates the light automatically. The solar street light charge controller can be custom programmed with timer settings such as on / off dim or interval time settings. By default the charge controller will keep the light on from dusk until dawn. The detection of voltage coming from the solar panel will switch the solar street light off and begin re-charging the batteries. Quality solar street lights keep enough back up battery power in the reserve storage to operate without charge for 4 or 5 sequential days. This is to ensure operation is not affected by heavily overcast, dark or cloudy conditions and the lamp will continue to operate during these times. 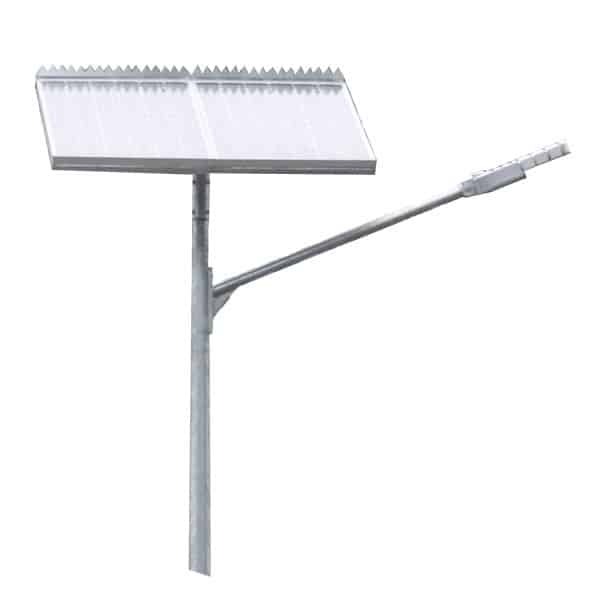 Solar Street Lights – These are the largest solar lighting products we offer coming in two main sizes. 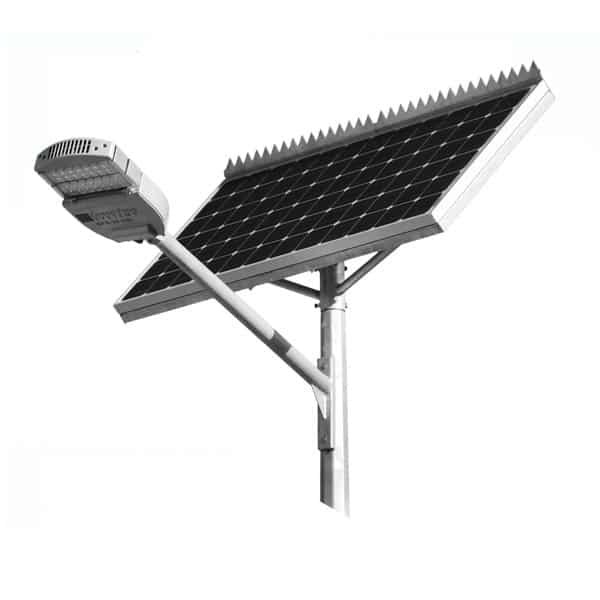 The biggest street light available is the GFS-400, an 8.5-meter solar street light is as tall as a street light and can be used for large car parks, intersections and can run at either 30W, 60W or 90W. Other applications include the illumination of streets, roads, mine sites, perimeters, sports grounds, industrial process lighting and stock yards….etc. 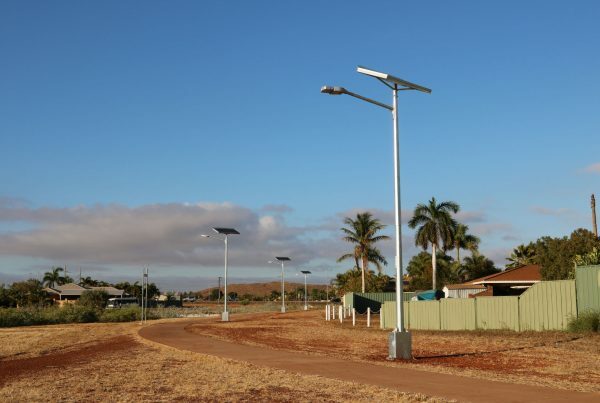 Most people don’t require something as big as the GFS-400 and rather go for the more cost effective reliability of the GFS-200 6 metre solar street light. This is shipped as a low voltage DIY lighting kit and can be installed by just about anyone. It does not require an electrician to be present and requires only 4 simple colour coded plugs to commission. 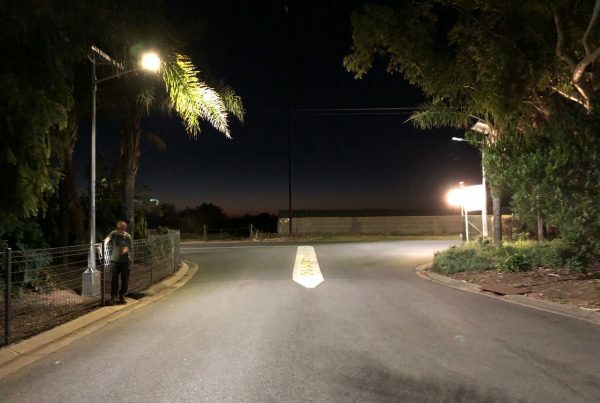 The possible uses for this type of lighting are huge, not only for the illumination of streets as the name suggests but also for all types of roadways, bike trails and pathways, minor intersections, public spaces, parks, picnic areas, caravan parks, coastal footpaths and laneways, the list goes on! Quality Materials & Construction – 3mm steel for street light poles are the minimum anyone should seriously consider if there is any chance of vandalism or high winds. One indication that solar lighting has been designed somewhere other than Australia is a sub-standard pole that simply will not last the Australia conditions for as long as you’d probably like it to. Cutting corners on something like this puts people and property at risk, cheaper poles may be cheaper but you need to consider whether you’d be prepared to stand under it during a storm or windy conditions. Environmental Resistance – Look for a good level of environmental resistance; remember these things are going to be outside for a long time hopefully! So, depending on where you are situated a hot-dipped galvanised steel is probably the most resistant finish. Elements like rain and flooding are far less likely to effect or damage this type of finish compared to untreated or painted steel. Marine-grade powder coated finish is sometimes applied over a galvanised finish, and if it’s good quality paintwork, this can also take a beating, even in salt-rich coastal environments. IP Rating – If you’re planning to install in a particularly demanding environment then it’s important to check the IP rating. IP rating stands for ingress protection, which defines the levels of sealing effectiveness of electrical enclosures against intrusion from foreign bodies (tools, dirt etc) and moisture. This will tell you how resistant you’re solar light will be to things like humidity, salt from coastal locations, wind and dust in cyclone regions. Pole Height Options – Make sure various pole heights are offered; increasing the pole or mounting height of your solar street lighting will allow the light to cover a greater area. 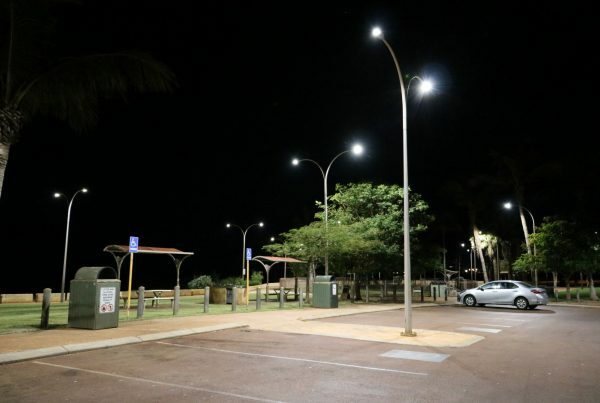 This is particularly useful if you are only seeking to use your solar street light for general lighting in areas such as parks and industrial grounds because it will require less lights in total to cover the same area. Fully Autonomous Operation – I know it might sound obvious but any solar street light that requires the solar charge controller to be manually adjusted or reset is only going to give you trouble. Pick something that guarantees zero maintenance once the unit has been commissioned. End to End DC Operation – Some solar lights will convert DC current from the solar panels into 240V AC (at a 10% loss) These systems are wasteful and require an electrician to install because of the 240v components. Try and stick with a 12VDC system, that way you’ll be able to install or service the unit yourself. High quality construction – 3mm robust steel structure with a hot-dipped galvanised finish to ensure maximum environmental resistance even in salt-rich coastal conditions. Currently installed across Australia in high humidity, coastal and cyclone areas. Various heights and options are available up to 9 metre running at 90w full brightness all night. Fully autonomous operation requiring virtually no maintenance once the unit has been commissioned. 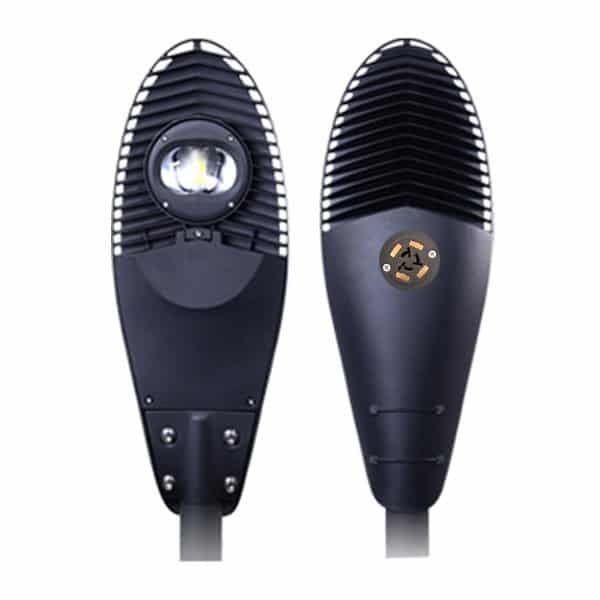 LED Light head is independent from the solar panel which can be rotated for maximum solar yield. No trenching or cabling required! Using LED solar lights can save you time and money in planning and execution of a lighting project by eliminating expensive mains cable installation costs and grid connection costs. Environmentally responsible. Minimises your carbon footprint. No unnecessary green-house gas emissions. Makes full usage of the green, free solar energy available to us all. 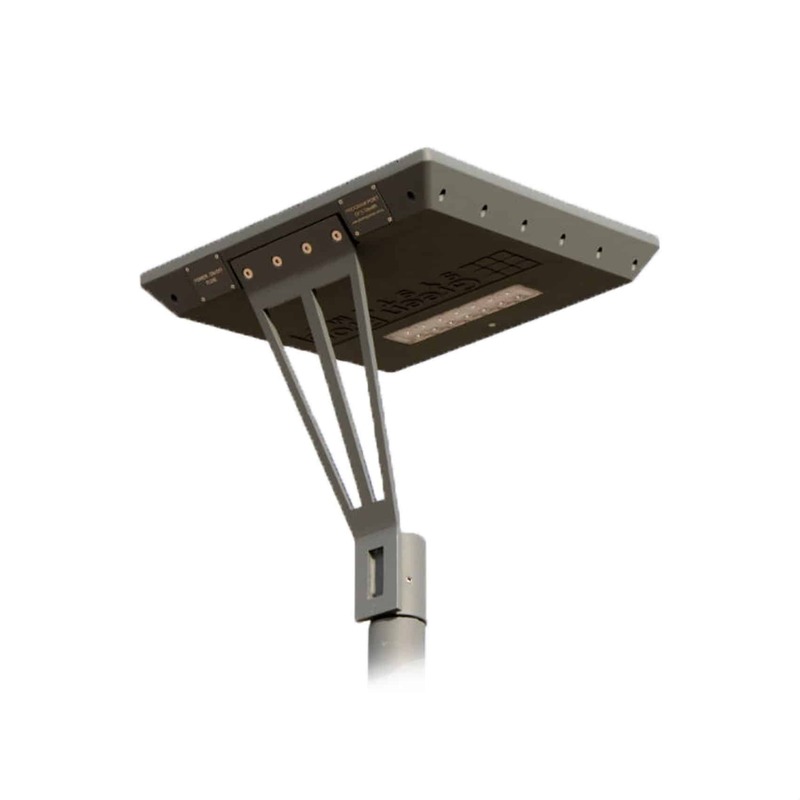 Eliminate ongoing expenses associated with grid powered street lights. Can be safely installed in remote areas where mains power is unavailable, unreliable or difficult to access. → Solar Street Lights & Street Lighting Kits designed & engineered in Australia to run all night in any weather conditions – Leading name in solar street lighting design and pioneer of the do-it-yourself solar street lighting kits. → Field tested technology. Proven to withstand the harshest conditions across Australia. → Solid reputation built on sound advice and technical expertise. We can design solar street lighting solutions from planning right up to production. → We supply the most reliable, vandal and environment resistant DIY Solar Street Light Kits available. Used for streets, roadways, intersections, car-parks, bike trails and paths. → We have a range of solar street lights to suit almost any application. Whether your project is a small roadway or path, or a large car park, we have proven solar powered solutions to suit your project in a DIY kit form that can be assembled by almost anyone. → Plug-N-Play IP-68 Connectors for Easy Install.